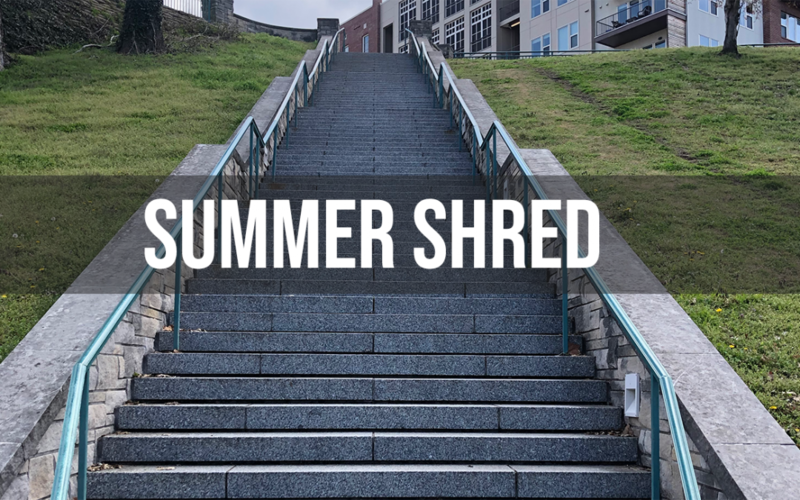 It’s that time of year again when the “summer shred” challenges are in full swing at gyms everywhere. I thought I would share a few tips with you that I think can help give you a better chance to be more successful and maybe win that sweet pot of cash at your gym. Enjoy, and if you have any feedback or questions just hit me up in the comments or on social. Too many times sleep is the first thing to get cut out of our daily routine. We get busy trying to fit all of our things into the day and end up sacrificing bedtime hours. Sleep is very, very important to our brain function and how we show up to perform the following day. It’s also very important for recovery. So when you are training super hard in the gym trying to get that summer shred on, you need to get some really good sleep at night so that you can recover properly for the next day. Try shooting for 8 hours of sleep every night. Also try putting your screens away for an hour before bedtime to settle your mind down a bit before laying down to go to sleep. Meal prep gets beat to death so I won’t spend much time on that, but we all know that we need to be planning what we are going to be eating for the week in advance. But it also helps to commit to what days and times you are going to be working out at the gym. If you decide you are going to workout on Monday, Wednesday and Friday at 5 p.m., put it down on the calendar and commit to it. Do this on Sunday when you’re planning your meals. Take it a step further and gather your workout clothes for the days you are going to be going to the gym. Have them ready the night before so that you don’t have that as an excuse to not get to the gym. Make it as easy as possible on yourself. If the alarm goes off at 5:30 a.m. and you don’t know where your lululemon shorts are you may just decide to go back to sleep instead. This one can be a game changer. I forget where I got this idea, but it is pretty solid. It really helps to be accountable to someone. So tell someone what you are doing. For example, tell a co-worker or your spouse that you are working really hard on your summer shred and you’re going to go to the gym 4 times every week. You are going to check in with them every day you go. If you don’t go to the gym when you are supposed to you owe them $20. This could get expensive if you start skipping workout days, and will help keep you motivated to go. You never know, it may also inspire the person you pick to start going to the gym too. A huge mistake I see a lot of people make is trying to do a complete 180 degree turn from where they currently are. For example, throw out all the bad food, exercise every single day, only drink water, never go out to eat, weigh yourself every single day, etc., etc. If you’re like a lot of people, these kinds of drastic changes will likely end up in failure. 3 months from now you’ll be beating yourself up and wondering why you couldn’t stick with your plan. Start small. Maybe you put sugar in your coffee every morning. Focus on cutting that out for a week, and then the next week pick something else to attack. Maybe you struggle with getting to the gym. Focus on just getting to the gym 3 times one week. Once you knock that out, pick something else to work on. Most importantly, don’t beat yourself up when you fall off the wagon. Just get back on and start chipping away at those smaller goals. Eventually those smaller goals add up to really big victories. Ok, I know this may still be a little woo woo for some of you, but you should really give it a try. There are plenty of guided meditation apps out there you can put on your phone to help you get started. I use an iPhone app called Oak (https://www.oakmeditation.com/) and it is super awesome. I’ve been using this off and on for a few months, but I have been very consistent with it in the last few weeks. It makes a HUGE difference in my day. If you are like me, your mind is constantly spinning in a thousand different directions during the day. Simply taking 10 minutes a day to calm the mind and focus on breathing or loving kindness makes a world of difference. I believe there has to be some connection between learning to quiet your mind and resisting the urge to eat donuts. Seriously, it’s free and only takes 5 to 10 minutes a day to get started. Give it a shot, and I promise it will improve your attitude and focus.